Cut the top off your pumpkin then scoop out the seeds and use a spoon to get as much flesh out as you can. 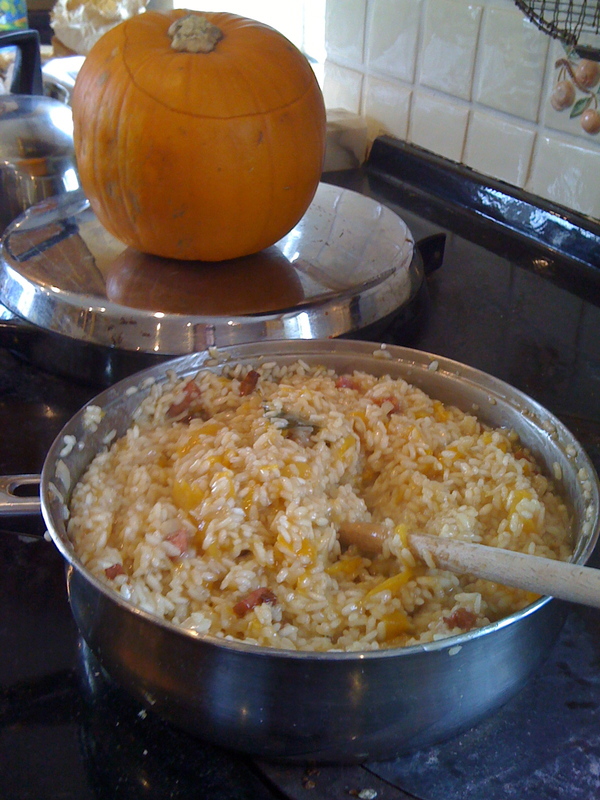 Keep the pumpkin whole to serve the risotto inside it for a fabulously festive effect! Or let the children carve it and put a candle inside. In any case, put the flesh in a baking dish covered with foil and cook for 40mn in a hot oven. Grill the pancetta in the oven until crispy so most of the fat will cook off – and not in the dish. Prepare your chicken stock and reserve. Melt the butter in the oil in a large thick-bottomed pan and fry the shallots and garlic in the hot oil. Once the shallots are golden and tender, add the baked pumpkin flesh, season well with the spices and cook for another 10mn on low heat until the flesh is nicely coated with the sauce. Add the bay leaves, slightly bruised in your hands. Add the rice in one go; then pour the wine glass by glass, followed by the stock and churn on low heat. Cook until all liquid has been used up and has evaporated which will take a good 45mn of slow cooking. The slower you work the better, for a dreamy end result. Season to taste and add the parmesan at the last minute with the roasted pancetta. Serve inside the hollowed out pumkin, in company of a sweet wine such as a good Sauternes. My lovely friend Segolene and I had this for lunch with a chilled glass of Château petit Védrines 2006 : Its honeyed and stewed apricot notes complimented the sweet and spicy flavours of the risotto very well indeed. And all 5 children loved it despite the chilli dimension and wiped the dish clean ! This entry was posted in Uncategorized and tagged pancetta, pumpkin, risotto, sauternes. Bookmark the permalink.